Engraving(Horimono) : Thick Koshi-hi with accompanied Soe-hi in front and the other side is parallel grooves, both runs chiselled half-way to Nakago. Forging pattern (kitae hada) : Kitae hada is uniform and fine Itame hada. The surface is covered in sparkling Ji-nie (hard metal granules over the surface) with swirl Chikei (darkish gleaming lines) activity. Tempering pattern (hamon) : Quenching area is a bit tight in Nioi, starting narrow Yakidashi on base, large Gunome on base then undulating Notare with box-like Hako-ba and Togari-ha where pattern of both sides are rather on well matching each other. The interior of temper is filled with foggy granules of Nioi where works with Nioi ASHI toward the cutting edge.. Temper of tip (boshi) : Temper of tip forms irregular pattern like side view of Jizou stone stature with medium circle turns back in a bit on deeper side. Tang (Nakago) : Fish bottom Funazoko shape Nakago is UBU. Ō-sujikai greatly slanting left file marks, flat on the back ridge where shows Katte-sagari slanting left filemark. V-shape (Kengyo) heel shape. Three retaining holes of Mekugi ana. There is clear chiselled small eight character inscription that starts with the official district title granted by the Imperial Court Yamato-dai-jō 大和大掾, name of clan Fujiwara 藤原 and then smith name MASANORI 正則. The power of Tokugawa clan decisively raised right after the historical victory in the Battle of Sekigahara in 1600. Yuki Hideyasu 結城秀康 - a 2nd son of Tokugawa Ieyasu 徳川家康 - was appointed an official feudal lord of Echizen (now in Fukui pref.) to built up defenses on the border from western enemies. 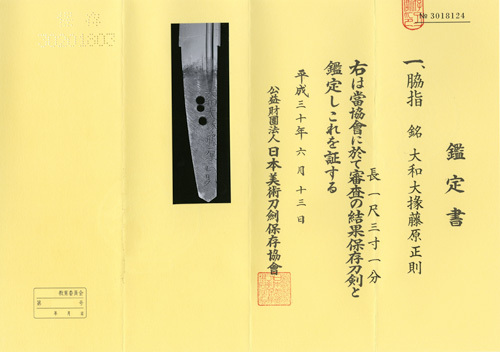 MASANORI 正則 who comes from Miyazu-town, Tango domain (current Miyazu-city, Kyoto) accepted an invitation to take up a post of an official sword maker to move to Fukui town, Echizen during Keicho era (1610's). He was therefore one of the greatest founders of Echizen sword makers who were active together with 1st gen. YASUTSUGU 康継. According to a reference book Nihonto Meikan, there shows some records of the year made in Keicho 13(1608), Gen'na 2(1616), Kan'ei 4(1627), Keian 4(1651) and 2nd generation KASANORI 正則 was active during Kanbun era(1660-). The subject stirring wakizashi is the sublime work by the 1st. generation MASANORI 正則 and was designed for the battle filed with full of Samurai majesty spirits during the very early age of Edo period right after Tokugawa Ieyasu 徳川家康 took over the assumption of ruling power. Deep in curve was designed for fast draw, Hirazukuri-extra large construction was working well for cutting through the openings of armor/helmet. Fine Itame forging ware from Yamashiro tradition of functional mixture with hard and soft fine steel was designed for durable construction. Nioi-based boundary Hamon that comes from Mino tradition is carefully quenched for the most supreme sharp performance. This prominent wakizashi comes with a masterpiece mount of Koshirae, nothing to match it in the world. This wakizashi blade remains an original very good condition ever since it was found from warehouse and very healthy for the passage of 400 years. Some minor scratches or slight darkish stains are perceived. Those wares will be removed upon restoration request by our skilled polisher.